With magnificent wines, a delicious restaurant, and breath taking panoramic views to match, Falkner Winery cannot be beat. Standing atop a 1,500-foot hill that overlooks the rolling vineyards of Temecula Valley, Falkner Winery epitomizes all the treasures that wine country has to offer. Arriving guests first admire the spectacular hilltop views and then they are faced with a delightful dilemma: Should they first visit the restaurant, or should they slip into the tasting room to sample the wines? Either way, they won't go wrong. Loretta and Ray Falkner, who come from diverse business backgrounds, opened Falkner Winery just over nine years ago. They take great pride in the consistency of their wines' style, believing they all have a similar feel--full-fruit flavor with a soft, clean finish. One fine example is the Falkner Amante, a Super Tuscan-style red that blends the flavors of Sangiovese, Merlot, Cabernet Sauvignon, and Cabernet Franc. Another blend, the Bordeaux-style Meritage, is a robust blend of estate-grown Cabernet Sauvignon, Merlot, and Cabernet Franc. Besides producing quality wines, the Falkners have deep interest in offering fine food. To this end, they built The Pinnacle Restaurant, with giant picture windows and an outdoor terrace overlooking the vineyards. Regardless of where they choose to sit, guests are treated to impressive vistas and an intriguing gourmet menu presented by the gracious staff. In addition to the restaurant, the garden offers a very private, serene setting for weddings and special events. The area includes a waterfall setting with fairy-tale white lights; arched, open patios; and a tree-lined yard. As a final complement to the winery, there are three venues offered for business meetings. The largest is the picturesque main dining room, for groups of up to 175 guests. The second is the production barrel area, which can accommodate 50. Finally, the VIP Barrel Room is a glass-enclosed, barrel-shaped room in the "Wine Cave" with room for 20. 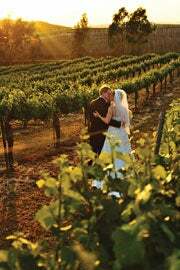 Hospitality flows freely at Falkner Winery, where exceptional wine, memorable food, and gracious entertaining present a wine tourer's trifecta in Temecula Valley. From I-15, take the Rancho California Rd exit and head east (5 miles). Turn left onto Calle Contento. The winery is on the right.